Our mommy bloggers were recently featured on the blog, Tidbits. Written by Kelly – a mom of two boys – she shares her experience at one her largest client’s annual conference. During the three day event, they had an awards program that highlights the best public relations and communications work in the New England health care industry. 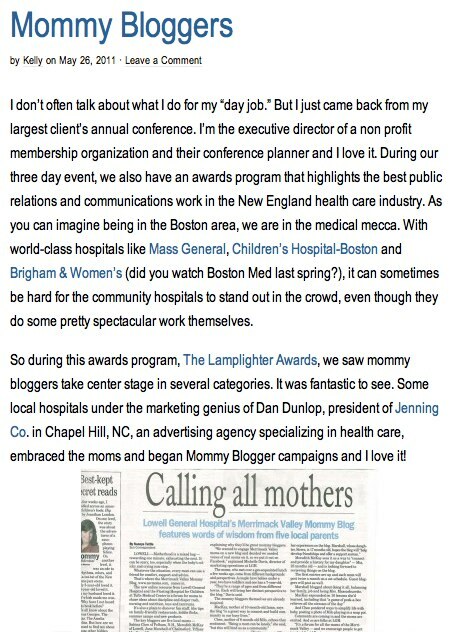 It was during this awards program, the Lamplighter Awards, that she saw our mommy bloggers – as well as others – take center stage in several categories! To check out Kelly’s blog post, visit http://momtidbits.com/2011/05/mommy-bloggers/. We greatly appreciate the support – especially from a fellow mommy blogger! And, congratulations to all of our mommy bloggers! Part of the blog post is featured below.